I made some more of my first real QSOs where you either call CQ or you answer someone's CQ. I've now made a few on 20 meters, 40 meters, and one on 15 meters. I've talked to a couple folks in Bulgaria, a couple in Russia, one guy in Guam, and a couple around North America. Tonight I talked to two nice guys from Texas, one near Dallas/Fort Worth, and one near Santa Fe. I really enjoyed talking to these guys because they weren't just "59, thanks for the QSO, 73s", we actually chatted a bit, and talked for a few minutes. The second one was over half an hour. I quite like longer QSOs, rather than the short hurried ones. I like it if someone asks a question or two and if I ask a question or two, and we can politely get to know a bit about each other's interests, lives, and activities, either within or outside of the hobby. Part of the "Amateur Code" that I like very much and intend very much to honor is that I don't think that On The Air QSOs are a good place for "ranting", or intemperate or intolerant behaviour. Courtesy rules. I like getting on the air and engaging in a courteous QSO. It may seem like a remnant of a by-gone era. Courtesy still rules, around here, and I'm glad it's popular in the hobby. Did you know that until now, satellites were weapons, under an important US law, and that Amateurs working with other Amateurs around the world could go to jail or face six figure fines for working collaboratively with other Amateurs on Amateur Satellite projects? I only heard about this because of an article on www.southgatearc.org which mentions the easing of these restrictions. 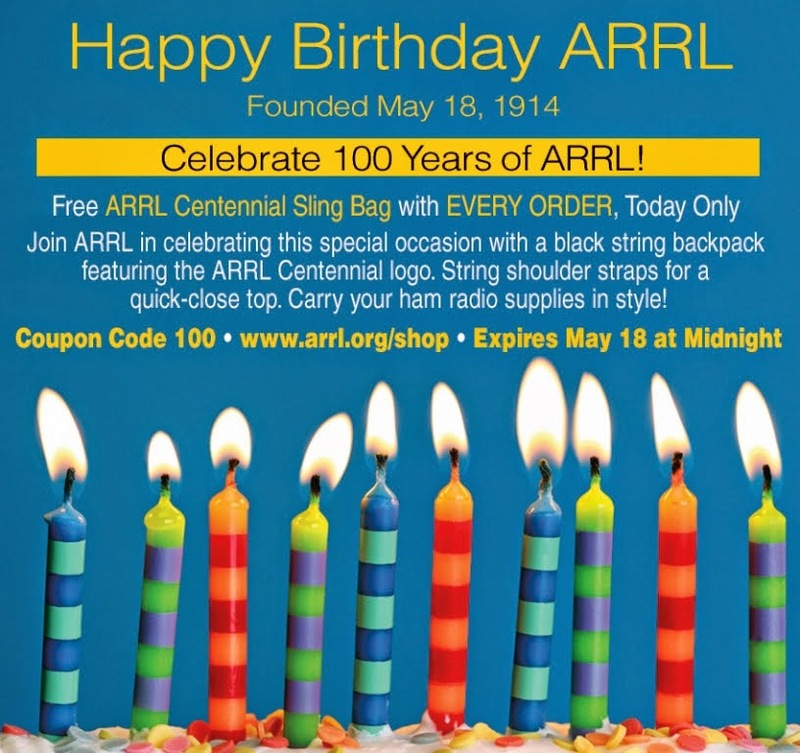 The American law International Traffic in Arms Regulations (ITAR) classified all satellites, even amateur radio ones, as being in effect, a weapon. The fear that this kind of law is built upon is not hard to understand. Remember sputnik? The USSR launched a tiny radio beacon into space, and the space-race was on. America lost the "first satellite" and "first astronaut in orbit" races, but I'd say they have lots of later victories to salve the wound. It's odd that in 2014, as a law that seems rather touched by a cold-war mentality may now be relaxed, and yet, as we watch the world around us, and the aggressive expansion by the Russian Federation into Crimea is also in the news, and Putin seems committed to reviving the USSR, a bit at a time, I wonder if the cold war may be coming back our way. It's a strange, strange world we live in. 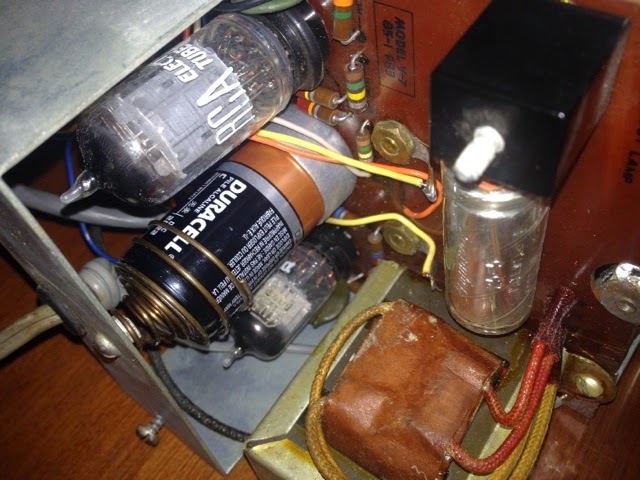 I got a heathkit two tube multimeter, which has a lovely simpson analog meter and two tubes inside. It tickles me to no end that this thing is still ticking over beautifully but that the five or so multimeters I have owned until now, digital no-name units one and all, have died various ignominious deaths. 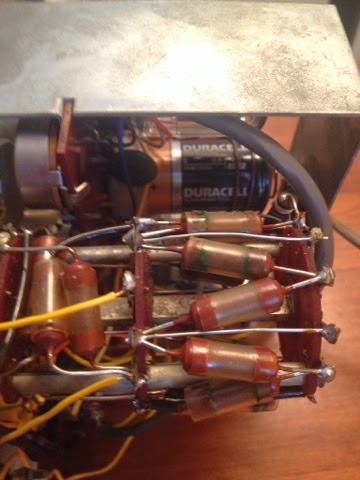 That Duracell just went in there today replacing a Mallory cell from the 70s. 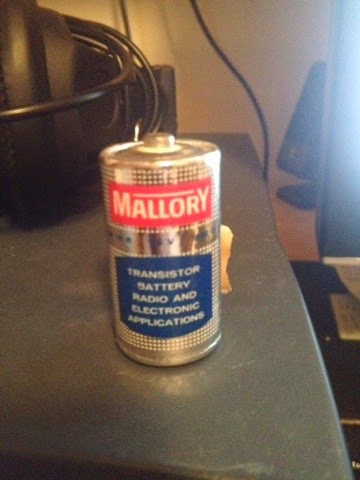 The sticker on the battery says someone paid 35 cents for this at Eatons. A network of resistors on a multiplanar rotary dial switch forms the heart of the instrument. I imagine a father and son building this in a basment in East York circa 1965 then going to the corner store for a cold bottle of Coca Cola in the original glass bottles. A sense of accomplishment, a father son bonding moment. A feeling that you have in your hands an instrument, a means of measurement, a suitable trusty bit of kit for any radio or TV repairman.